Is there anything like a fresh, hot out of the oven, homemade dinner roll? 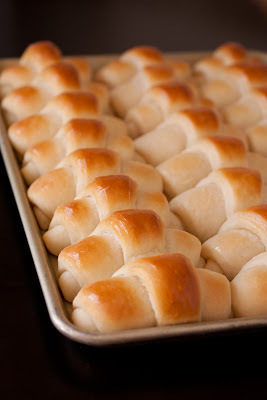 Dinner rolls are a classic that will never fade. These dinner rolls are dangerously good! How could something with so few simple ingredients be so delicious? I will tell you how: lots of butter, whole milk and a little patience. While creating this recipe, I was looking to achieve a tender, pillow-y soft texture, along with a light sweetness that wasn’t overpowering (if I wanted a roll that was super sweet I’d just have cake), with just the right amount of moisture and fats – hence the use of whole milk along with the butter. I prefer a larger ratio of milk than water because water has zero flavor so why let it waste good space in the roll?